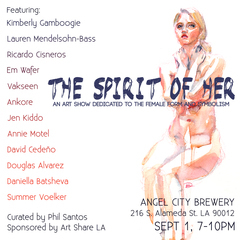 A fun art show about "The Spirit of Her"
This show aims to capture the essence of women through various forms of art. Either through fantastical and surreal figurative works or through the symbolism of allure and enchantment. These artists' styles range from tightly crafted with realism to painterly and sometimes whimsical free form movements. Each style being entirely appropriate for this theme. Some of these artists, like many of the greats, have dedicated their craft to utilize the female form as the ideal subject matter. "The Spirit of Her" brings these forms out of the deep cracks of the LA Art Scene and into the spotlight. These artists range from emerging fine artists to very experienced working artists.